I hope you were blessed by the first post in my “The ABC’s of Motherhood” series over at Stephanie’s corner. 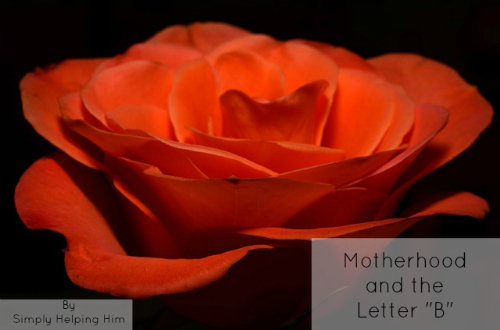 Today we are tackling a word that all mother’s are, but often fail to see in specific ways. In my post you’ll see how you can make a list of your own to see it in your life. Motherhood and the Letter “B” is for…..
Be sure to link up below before you take off! I love your blog. It is always encouraging to me. I too am a Christian. It is a challenge for me to talk about God’s word while relating it to every recipe or travel idea. Sometimes, I wish I would have just had an encouraging blog. 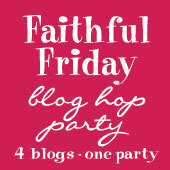 Anyway, Thank you for stopping by and linking up to my Fabulous Friday Blog Hop. Your yummy goodies would be missed! We all have our calling and though I like to cook and share recipes it doesn’t seem to be my thing all the time Thanks for sharing and stoppin by! Blessings! You’re very welcome! Thanks for linkin up! Blessings!